A woman of Sorek, loved by Samson (Judges xvi. 4-20). The chief of the Philistines bribed her to discover the source of Samson's great strength. Three times she failed. First, at his own suggestion, she bound him with "seven green withes," but these he easily snapped asunder. Then she tied him with new ropes: these also failed. Then she fastened the locks of his hair to the loom (see Moore, "Judges," ad loc. ), but with the same result. Finally, after many complaints that Samson did not trust her, he told her that his strength lay in his hair. Then, when he was asleep, she called in a man to cut off his hair. She then awoke him, and delivered him into the hands of the waiting Philistine chiefs, from each one of whom she received 1,100 pieces of silver. In all probability Delilah was a Philistine woman, although not necessarily a "political agent" of the Philistines (Cheyne and Black, "Encyc. Bibl." s.v. ; See Samson). 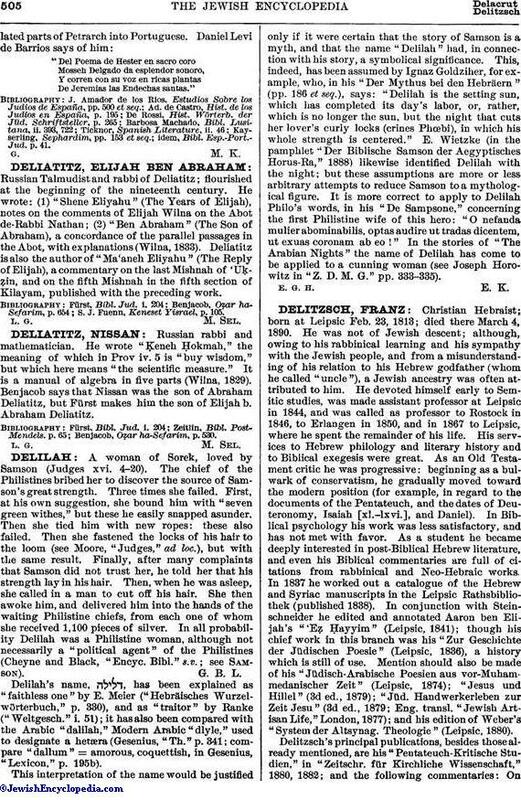 Delilah's name, , has been explained as "faithless one" by E. Meier ("Hebräisches Wurzelwörterbuch," p. 330), and as "traitor" by Ranke ("Weltgesch." i. 51); it has also been compared with the Arabic "dalilah," Modern Arabic "dlyle," used to designate a hetæra (Gesenius, "Th." p. 341; compare "dallum" = amorous, coquettish, in Gesenius, "Lexicon," p. 195b). This interpretation of the name would be justified only if it were certain that the story of Samson is a myth, and that the name "Delilah" had, in connection with his story, a symbolical significance. This, indeed, has been assumed by Ignaz Goldziher, for example, who, in his "Der Mythus bei den Hebräern" (pp. 186 et seq. ), says: "Delilah is the setting sun, which has completed its day's labor, or, rather, which is no longer the sun, but the night that cuts her lover's curly locks (crines Phœbi), in which his whole strength is centered." E. Wietzke (in the pamphlet "Der Biblische Samson der Aegyptisches Horus-Ra," 1888) likewise identified Delilah with the night; but these assumptions are more or less arbitrary attempts to reduce Samson to a mythological figure. It is more correct to apply to Delilah Philo's words, in his "De Sampsone," concerning the first Philistine wife of this hero: "O nefanda mulier abominabilis, optas audire ut tradas dicentem, ut exuas coronam ab eo!" In the stories of "The Arabian Nights" the name of Delilah has come to be applied to a cunning woman (see Joseph Horowitz in "Z. D. M. G." pp. 333-335).